I’m so excited to share about our grapes with you all – I can’t believe how much they’re producing in only their third summer! 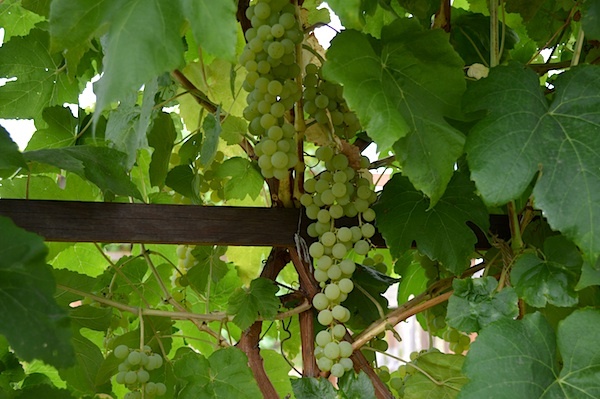 We had a large grape arbor over a seating area in our last house and I loved the shade the vine provided, as well as how it looked with grape clusters hanging from it, so I always wanted to find a spot for a grape arbor. 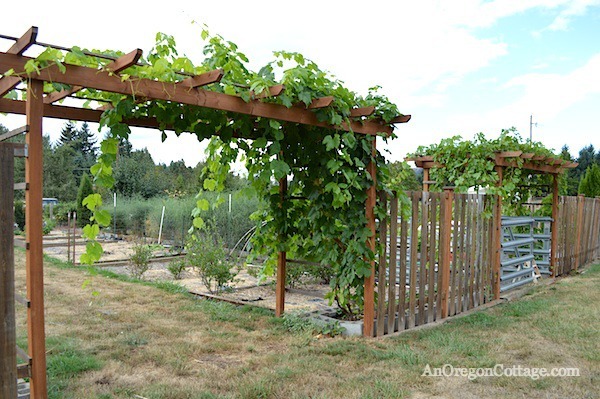 We built these two smaller arbors at the entrances to our vegetable garden and berry patch in the summer of 2010 and I planted one bare-root grape on each in early spring 2011. They were two seedless table grapes and that first summer they made it to the top of the arbors. 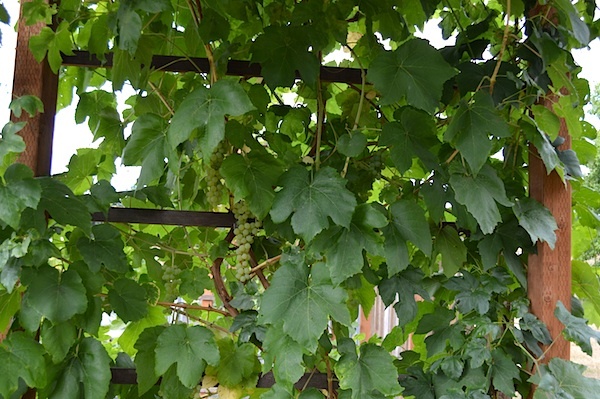 Last summer the red grape actually produced a couple of clusters of tiny grapes and it was the most prolific – growing all across the top of the arbor, while the green grape only made just over the top. This is our red table grape, a variety called ‘Flame‘ which I just learned is the second most popular variety grown in the U.S. because of its vigor, sweetness, and shelf life. I can certainly attest to its vigor – not only has it covered the top, it’s completely covered the other side of the arbor this year, too. 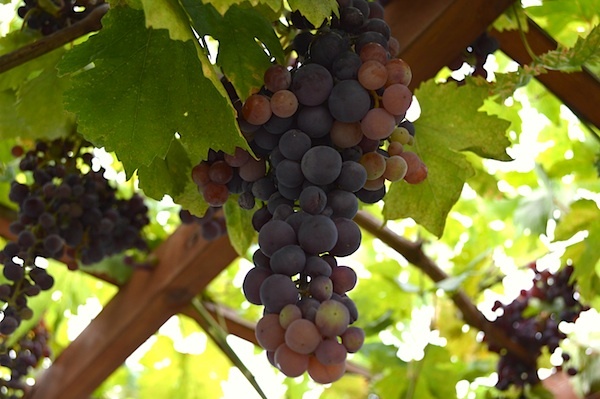 And as you can see – it’s loaded with grapes! And they are incredibly sweet! We’ve been having so much fun going out and picking some each morning to eat throughout the day. 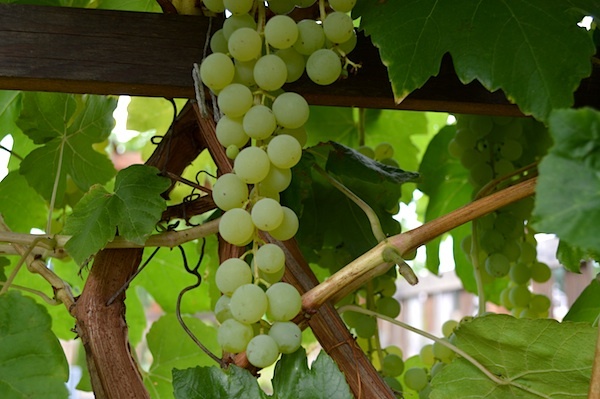 The green grape we’re growing, ‘Himrod,’ isn’t quite as vigorous and since it only made it to the top of the arbor last year, I wasn’t expecting it to produce this year. What a surprise then, when I saw some clusters forming a couple months ago. They are growing on the side of the arbor, though, since that was where the old growth was from last year. I think next year most of the clusters will hang from the top like the reds. There are actually quite a few clusters and the grapes seem to be more uniform in size than Flame. This variety is also sweet and very tender – they are my favorite of the two! I can’t tell you how rich and special it feels to harvest your own table grapes – I don’t know why it strikes me that way, maybe it’s because they seem a bit exotic to me (which is silly, as Oregon is now well-known for its vineyards and wines, ha!). The only bummer? I didn’t realize that both these grapes ripen at the same time – late August. Ugh – the race is on to see how many we can eat before I have to resort to juicing them! Have you tried freezing them whole? I do that with grapes I buy at the grocery and they are great tasting little bursts of cold. The kids think they are mini Popsicles. They last for quite a while in the freezer too. Oh, I’ll have to try that tomorrow, Jackie, as they are all getting too ripe for us to eat fresh much longer – thanks! These look just wonderful! I’d wish to see more pix on instagram though. Thanks for all the inspiration! thanks for this post. 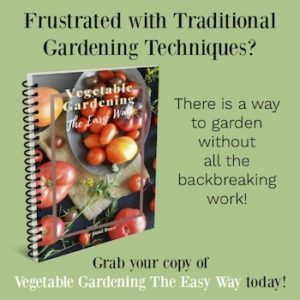 I want to plant grapes, but I had no idea on varieties! I had a grapevine years ago when my boys were young, where I used to live. I made juice from it / it was wonderful. THIS year I planted two grapevines here. One survived and was just starting to trail up the fence and while I mow my own grass a friend of my sons weedwhacks for me about every three weeks or so. While I did not expect grapes this year I was still sad to see that he whacked my vine! 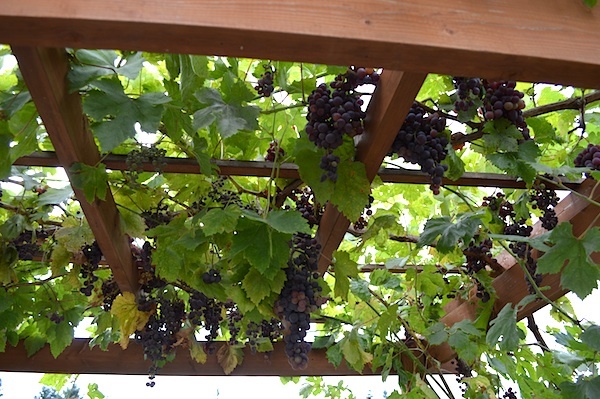 It survived but geez……..
Grapes are on our list to plant for next spring. I really want to make sure that they are table grapes. Wild grapes grow all around here so I don’t want to waste my time on grapes that are not sweet. Your arbors are beautiful, I’m going to have to show them to my hubby. I love grape jam and homemade raisins! Thanks for sharing! We just moved and I’m excited to get some grapes growing. BTW – do you water them? Yes, Rachel, they are watered regularly with a soaker hose – about once a week in the summer. 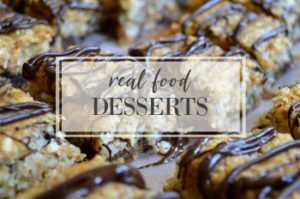 I’ve never made raisins – I’ll have to try some this year! Yours looks wonderful, we may have to try to find a spot to grow some ourselves. 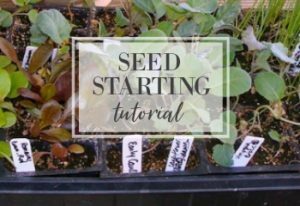 Thank you so much for hosting, we are still running our Homesteaders Blog Hop over at Modern Homesteaders. 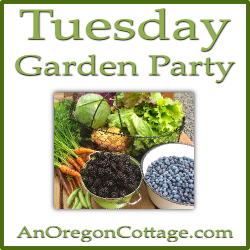 Please come on over and join in! Your grapes look amazing! I’ve had good luck with Concord grapes at my last two homes. I’m waiting for the vines at our new place to reach maturity and provide a harvest. Looking forward to that!